Laurel Myers was still in elementary school when a shipment of goats to her family’s farm in Bridger, Montana, left everyone sick with fever. 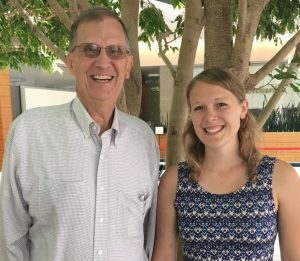 “So I grew up thinking of the connections between human and animal health,” she says. In work that looks at the many factors that can influence health and disease, Myers and Anderson, a 1972 graduate of the UW-Madison medical school, are kindred spirits. Anderson may be retired, but his enthusiasm for the hunt to identify what makes people sick is catching. His passion blossomed when he spent four months in Afghanistan as a medical student, one of four American students matched with Afghani counterparts. The Americans knew academics and high-end tools. The Afghans were already practicing medicine and understood developing world illnesses. They might not know X-rays and electrocardiograms, but they knew how hard it could be just to get to a clinic. As the Occupational Safety and Health Administration and the Environmental Protection Agency were born in the early ‘70s, Anderson landed a residency in occupational medicine at Mount Sinai in New York, then stayed to do research. In 1980, he established Wisconsin’s environmental and occupational health program, becoming the chief medical officer in the Wisconsin Division of Public Health. With funding through the National Institute of Health Sciences, Anderson took to the field, working with communities, factory owners and unions and completing groundbreaking work to show what made whole populations sick. • When Michigan farmers and cows were suddenly ill, he helped discover that a fire retardant had been mistakenly mixed with feed supplements. • When families of asbestos workers were getting sick, he was on the team that discovered workers came home with enough asbestos on their clothes to cause illness. The finding led to national requirements to provide work clothes, changing rooms and showers. • When workers in Chrysler’s Wisconsin engine plant were getting sick, he helped trace the cause to the oil used to cut glass. Workers inhaled oil mist laden with bacteria, mold and pesticides. Anderson sat on committees with the company and the unions to create new safety standards. “What was fun with the field was there were so many things going on,” Anderson says. Newborns would be sick and throwing up, he discovered, because of residue from copper pipes in new homes. Mobile home dwellers were sick because of the formaldehyde in particle board. He looked at fish, insecticides, lead, mercury and more. Propelled by the firm belief that treating people when they get ill is only part of the equation, Anderson says there’s still a lot to be done. In occupational and environmental health, practitioners test the water when kids have diarrhea or look at lead exposure when children do poorly in school. They look at food and the pesticides in the food when rural families are sick. 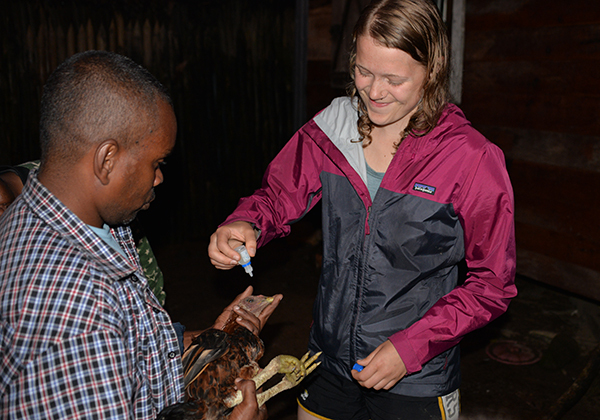 Laurel Myers helped administer ocular vaccines to protect chickens in Madagascar against Newcastle Disease. 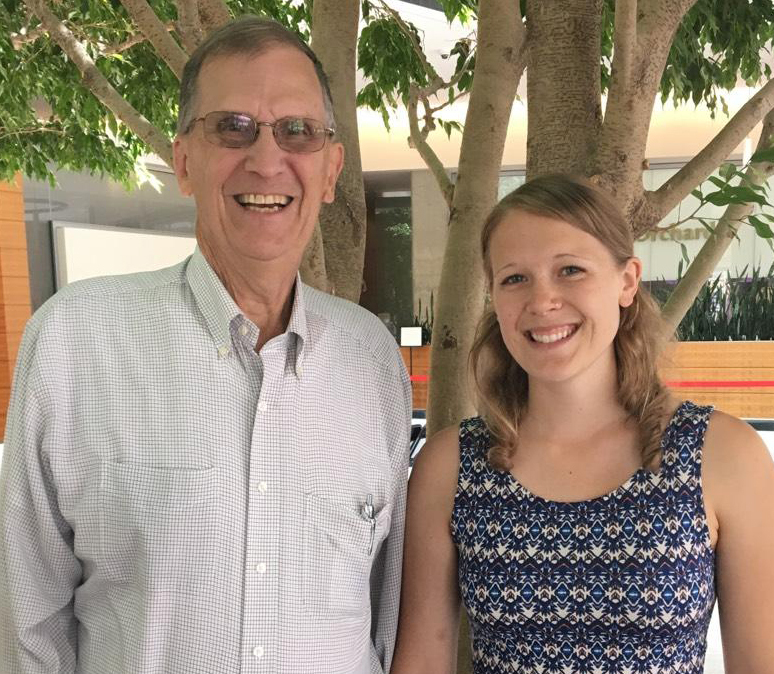 Occupational and environmental health has never been flush with resources, and Anderson’s award ensures funds for global health projects, whether students need money to use remote sensing data for modeling or completing a field experience. For Myers, the idea of occupational health or environmental health fits perfectly into the ideas of One Health and Planetary Health, both centered on the idea that human, animal and environmental health are interlinked. “I really believe everything is connected,” she says. In Madagascar, she put her belief into action. Chickens are an important alternative protein source to bush meat and can help protect the environment by limiting hunting. The chickens in Makira Natural Park, however, are infected with Newcastle Disease, a virus that spreads through the air and can wipe out flocks. 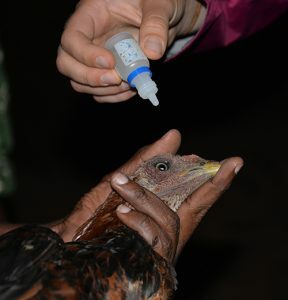 In addition to vaccinating chickens, Myers helped to educate residents about animal husbandry and food safety and will research other communities’ responses to the disease.